If you're gaming for a micro or teacup pig, know the game's name is definitely "Buyer Beware." Yes, those pigs are tiny when you bring them home, but as they mature they have the unfortunate habit of growing larger than anticipated. Do your homework before purchasing a pig. Better yet, adopt one. If you adopt an adult, you know he's reached his full size. Of course, if small stature matters, there's always the guinea pig. While micro pigs, also known as teacup pigs, are quite small when they're little, they mature to between 40 and 65 pounds. While that isn't large for a pig -- commercial meat breeds top out at 800 pounds -- it's not a small pet. If you want a pig the size of a medium breed dog, the micro pig is a good bet. If you were looking for a porcine that permanently stays the size of a small dog, though, there's no such thing. To avoid misconceptions about how big your pig will grow, ask the breeder to let you see his parents. If either one is more than barely larger than you can deal with, pass on those parents' piglet. Pigs are clean and smart, and they can be quite friendly. Most pet pig breeds get along well with cats and dogs, although a dog or cat may want to go after the porker. You can train pigs to do their business outdoor or use a litter box. You can teach them tricks. 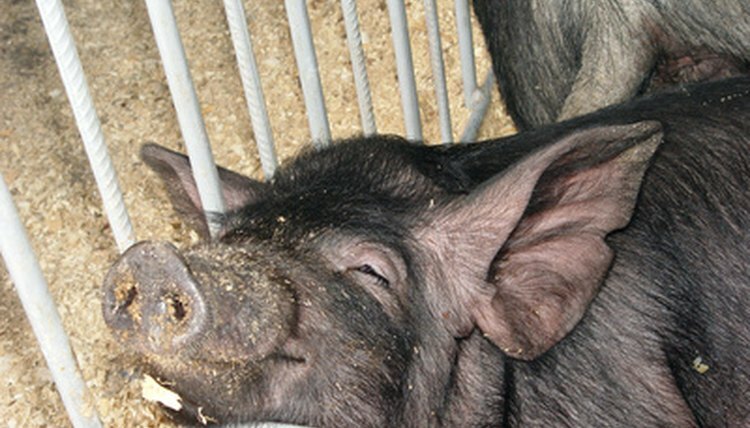 Pigs love attention, so they're not the best choice if you don't spend much time at home or they may make their own attention to your home's detriment. Generally, they require less exercise than a dog, even if you want to take them for daily walks. Your pig eats commercial pig chow along with treats of fruits and vegetables. Make sure to feed him the proper amount of food, as overfeeding just leads to an oversize animal. You do not want to deal with a sexually active pig. According to Nevada-based Vegas Pig Pets, the No. 1 reason people give up pet pigs is because they have failed to spay or neuter them. VPP points out that unspayed females go into heat every three weeks and that unneutered boars are aggressive -- and they stink. Vegas Pig Pets adds that the No. 2 reason people give up pigs is because the animal grew far larger than they were led to believe it would. Unfortunately, if teacup or micro pigs get bigger than their owners anticipated, they can end up unwanted. Since adopting a grown pig rather than purchasing a piglet takes the guessing out of the Beware game, and spaying fixes the baby boom, you won't lose. Retail micro piglets are expensive; you might also save money by adopting a grown pig. Columbia News Service: One Small Problem With Pet Pigs. They Grow.